We are at a point in time where the convergence of several factors has the potential to meaningfully change investing, and the business of investing over the next decade. There is a need to thoughtfully examine these factors and initiate a dialog on how the investment industry can best serve investors going forward. Predictions are either consciously or unconsciously biased by our beliefs or incentives, and may end up being wishful thinking rather than an expectation of what could transpire. I acknowledge that despite my best intentions, this article may be colored by my own personal biases and self interest. This is a high level concept note and I hope to develop a better understanding of these factors over time. It is hard to paint a picture with a few brush strokes across a fragmented canvas that spans over $270 trillion of assets across the globe, but hopefully we can get a collaborative process started on improving the investment industry to better serve investors. 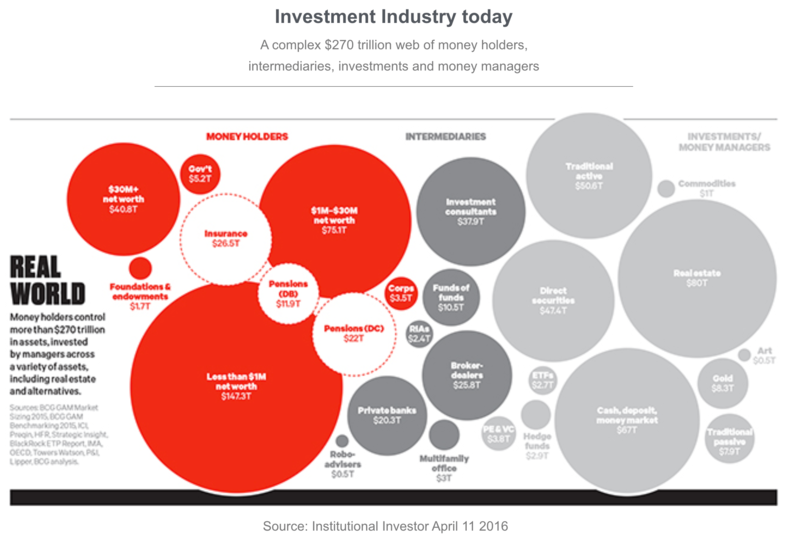 The investment industry today is a complex web of intermediaries, advisors, managers and service providers. With terms such as alpha, beta, production, top down, bottoms up, active share, etc. it is very easy to forget the purpose behind asset management – the industry is responsible for helping individuals and organizations (that act on behalf of individuals) safeguard and grow money that they have today, in order to use that money at some point in the future. The question that end investors are looking to answer is not “stocks or bonds” but “can I meet my needs in the future”. These needs could be having enough money for retirement, or paying out a future obligation, or safeguarding assets for multiple generations. Businesses that recognize this shift and tailor their business models to meet investor’s objectives are likely to play a defining role in the future of investment management. 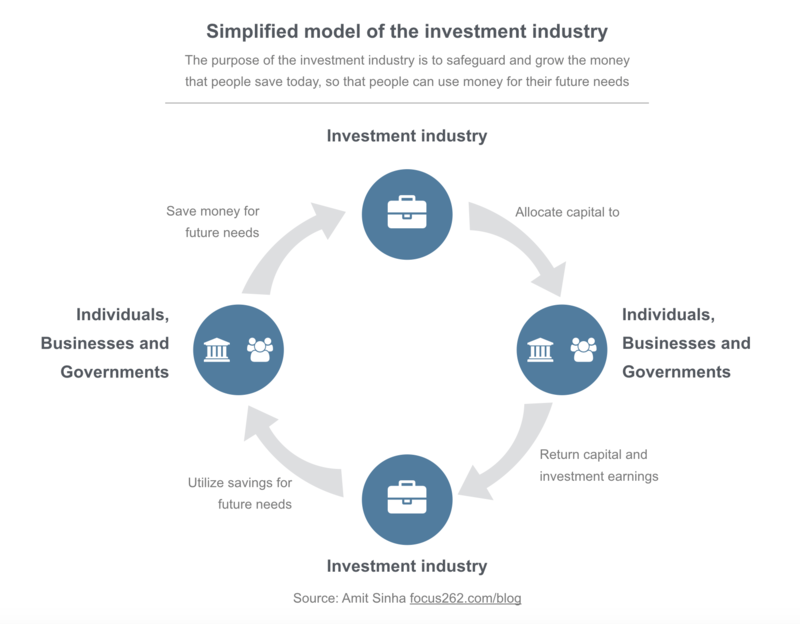 With a focus on understanding the investor’s objectives, and the trade-offs that come with them, the investment solutions themselves may end up becoming simpler, reducing the need for unwanted complexity and false precision that tends to permeate as businesses try to differentiate or justify their value and existence. This is likely to result in the creation of two forms of businesses – specialized solution providers and commoditized products (e.g. ETFs/Index) that are used by solution providers. Certain businesses are profitable based on taking advantage of client’s ignorance vs. providing insights. In the past, asset managers could get away with hidden fees and transaction costs. Financial advisors could place clients into higher fee or sub-optimal products driven by where they were getting higher commissions. With multiple layers of fees and complexity, even well intentioned advisors in many cases are unaware of the true cost of the strategies and structures that their clients are invested in, and not equipped to identify better alternatives that deliver similar outcomes. This will change. Regulatory change, combined with accessible information through innovation in technology will make it hard for flawed business models to continue. Additionally, an increasing number of talented individuals within the investment management industry are recognizing the need to change and pushing their organizations to move away from such models. Businesses that differentiate themselves based on insights are likely to grow. Those that rely on the lethargy and ignorance of clients are likely to suffer. An investor’s portfolio (institutional investors and family offices to begin with, but may even extend to individual investors) is likely to be recast between a “markets driven portfolio” and a “cause driven portfolio”. A markets driven portfolio would be invested in traditional capital markets, and managed based on risk and return objectives. In addition, investors are likely to get engaged in cause driven portfolios. These can range from large scale infrastructure/public-private initiatives to private investing initiatives such as micro-lending, venture capital, etc. While both approaches would strive to generate positive risk-adjusted returns, their payoff profiles and risk factors are materially different. There is an opportunity to create innovative businesses that can understand an investor’s needs and provide market driven and cause driven investment solutions. What are the catalysts for change? Exodus of talent: Bogged down by inefficient processes, deleveraging and disappearance of alpha, talented individuals from large banks and asset managers are questioning the old way and trying to develop or participate in new business models. Information: Broader and more uniform access to the same investment ideas and information reduces the edge that traditional asset managers had in terms of information advantage. It is also becoming easier for investors and advisors to compare a particular fund manager or strategy with other potentially better alternatives. Distribution: Robo advisors have created a new benchmark in client interface and digital marketing at the retail level. They have opened up a new direct line of communication with the end investor, and defined a new set of expectations in the mind of the investor. What are some business models that might succeed? The media/digital media/advertising industry provides an interesting parallel to look at the transformation of investment management. Like all analogies its not perfect, but an interesting starting point as a thought experiment. Businesses that have the last mile connection to the client will continue to be valuable. However, composition of providers of that connection may change. In the case of media, from cable providers, the last mile is now increasingly provided by Netflix, Hulu, Amazon, You Tube, etc. In the case of investment management, there may be a similar shift from the traditional incumbents such as wirehouses or investment consultants to new businesses. In the retail space for example, innovators are building new last mile connections in the 401k and financial advisory space. On the institutional side, advisors that provide insightful portfolio solutions may be preferred by investors over traditional manager selection consultants or large asset managers that offer products without insights. A lowering of the barrier to entry means that a traditional active management fund house with a large brand and distribution, but poor content (e.g. an active manager who cannot demonstrate value) is likely to lose out to insightful solutions providers (Netflix). This type of transformation is especially likely in the more complacent areas of asset management, such as 401k services or pension solutions. Just two players, Google and Facebook, control 64% of the digital advertising market, and smaller players continue to lose market share. In the case of investment product, large players like Blackrock and Vanguard have the ability to become “providers of choice”, essentially removing the need for multiple low cost providers of index funds, for example. Some of the larger end investors have the scale to build out their own investment operations. This could prove interesting – instead of giving away hundreds of millions of dollars in fees to asset managers, these investors may invest in their own internal investment teams, and in turn make those into successful solutions businesses. Several of the larger Canadian pensions have already embarked on this journey.